If you are in the market for a paper creaser machine that will preserve images without cracking or tearing, check out the solutions available from Prosource Packaging. These easy-to-use, economical machines offer crack-free scoring of stocks, pamphlets, brochures, greeting cards, booklet covers and perfect-bound books. Our creasing solutions will complement digital printing systems to help create glossy covers and digital prints. 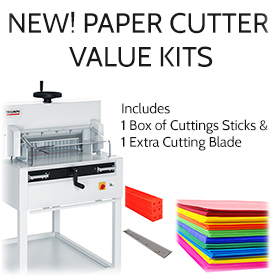 Choose a paper creasing machine that offers a simple, innovative design. Click around our site to pinpoint the paper creaser machine that will best match your needs and budget. Contact us toll-free at 1-800-203-0233 if you require additional assistance.